Cheeseburgers in Paradise is a bar and burger/sandwich eatery, brightly colored and using a tropical theme. It features a lot of Jimmy Buffet tunes and has some nice outdoor seating. I became familiar with it when work meetings with vendors would be conducted here. Salesmen and sales engineers respond well to the place. They enjoy the surroundings and business gets conducted easily here. I’m not going to pretend that CIP is a great eatery, but it’s a fun eatery and they do have their food moments. Take their dragon fire wings, for example. 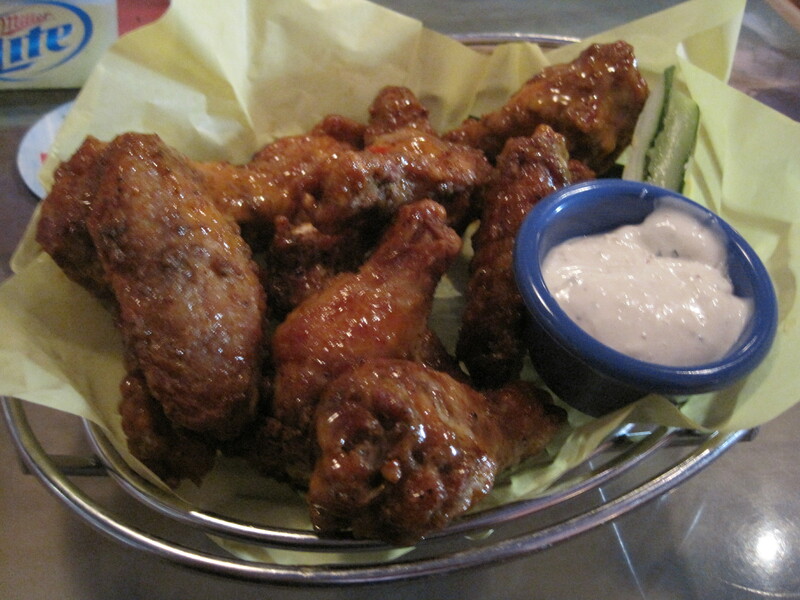 Big and meaty, with a sweet and spicy sauce, these are the kind and size of wings I’d expect (but never get) at a wings place. What I liked best on this visit, though, were their Cruzan shrimp. 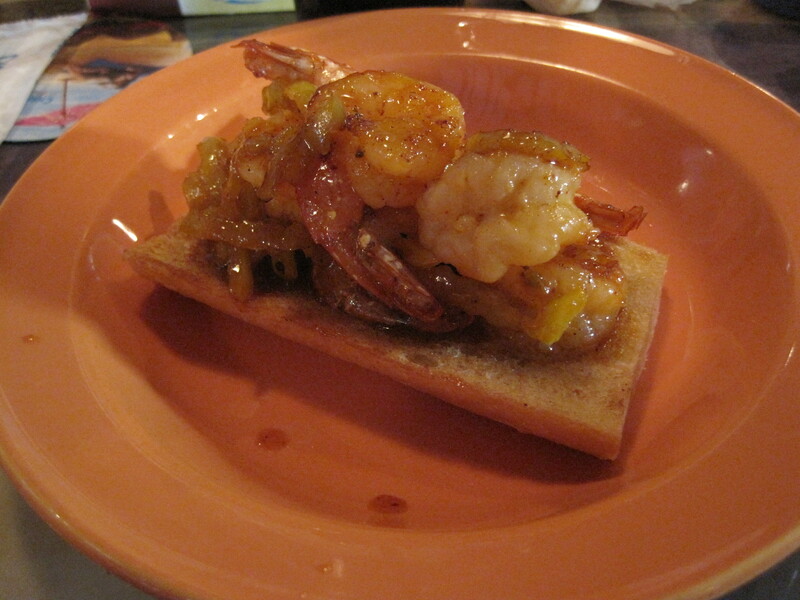 Shrimp and banana peppers and a rum reduction go together extremely well. Service here has been come and go. This visit I had an excellent server. There have been times, however, when the manager moved me to the bar because the person handling tables wasn’t cutting it. In short, if your expectations are reasonable, you’ll probably not be disappointed. This is a place trying to sell drinks, after all. But their burgers and sandwiches can be nice, and the outside seating is a lot of fun from spring through fall. Verdict: Fun eatery, with some good food. Recommended. I’m out of town this week, so if the nature and number of posts are smaller than ordinary, that would be why. I’m going to try and eat at a couple local restaurants – I’ll be in Louisiana and Texas – and so we should have some interesting new content in the days to follow. That said, I still haven’t published all my content from San Francisco either. I have articles on two Japanese restaurants to complete. 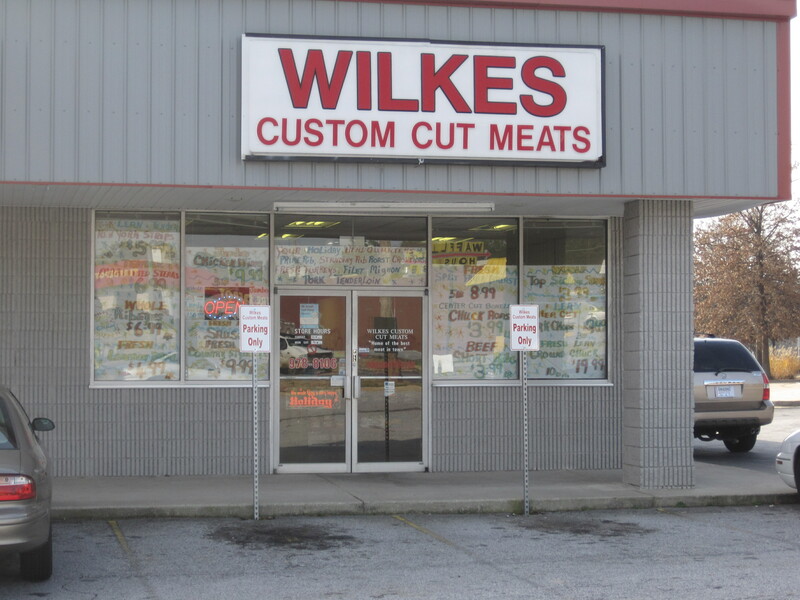 Wilkes Meats is a butcher shop with multiple locations, one in Snellville. It has been covered extensively by Snellville Eats (articles here, here, and here) and that has led me really to avoid talking about it in the past. 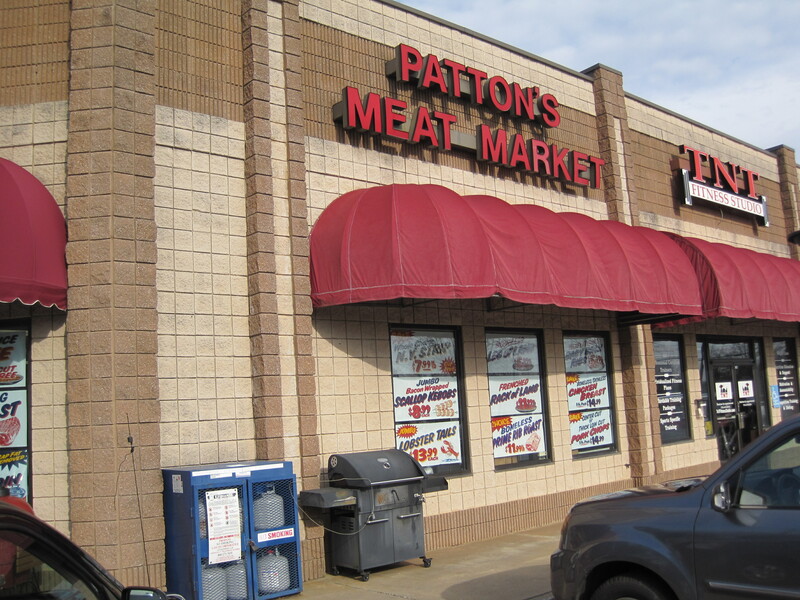 But as we have recently reviewed Patton’s Meat Market, I thought I would touch base with this shop, to compare and contrast the various meat options, as I know them, in the city. By far the least expensive meats come from Mexican butchers, such as La Jalisco Carniceria and the Lilburn International Farmer’s Market. 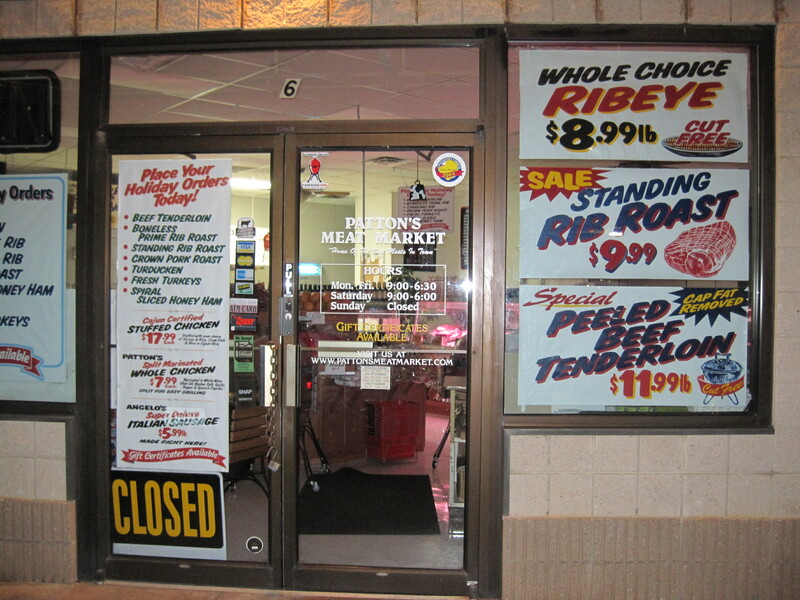 On the other side of the price equation are supermarkets such as Kroger and Publix, and then also high end butchers such as Patton’s. Wilkes serves a niche that wants a better cut of meat than the supermarket at a reasonable price. When I went, I didn’t have any trouble getting the attention of people behind the counter, nor did I see it lacking in civil conversation. They had good looking strip steaks, ribeyes, extra large sirloins and they also had marinated meats. They had a more extensive pork section than Patton’s. I bought a marinated filet mignon for the holidays and a pound of stew meat. The filet mignon, a thick cut of meat and wrapped in a thick slab of bacon, cost about 8 dollars. And when I cooked it for Christmas Eve, it was amazingly tender. Issues? The smell of the butcher shop, as noted by Snellville Eats. The cheeses and sausages were stripped when I dropped by. The grade of meats wasn’t noted, though the shop claims their meats are all Angus beef. But none of these are deal breakers, and yes, I think Wilkes can be a perfectly reasonable option for good meats at fair prices. 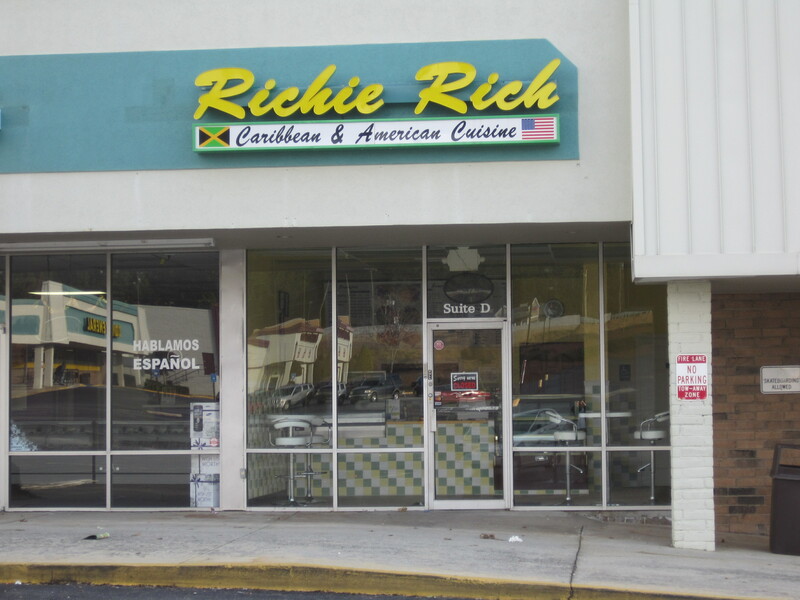 On 285 Foodies, there has been a certain amount of conversation about an eatery named Richie Rich, at the corner of Main Street (78) and Henry Clower Boulevard. It’s a Jamaican place. Gadget Geek seems to like it, but felt his one trip there wasn’t enough to cover the menu. I’d have liked to try it, but it was closed this Sunday. Patton’s Meat Market was a recommendation I saw posted by the author of Marina’s Recipe Box. I was looking for something appropriate for Christmas, as I would be cooking for myself. I looked up the location (Peachtree Industrial at North Berkeley Lake) and tried to get there a couple times from work. That was never successful, as traffic along 285 was far too slow for me to get there on time. I finally managed to get there around lunch time. 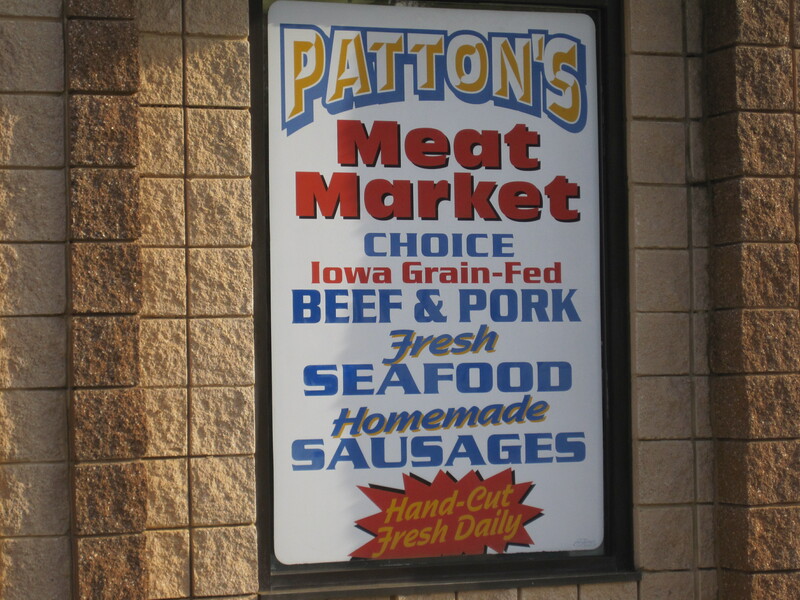 Patton’s Meat Market does indeed offer prime grade meats, as well as choice cuts. 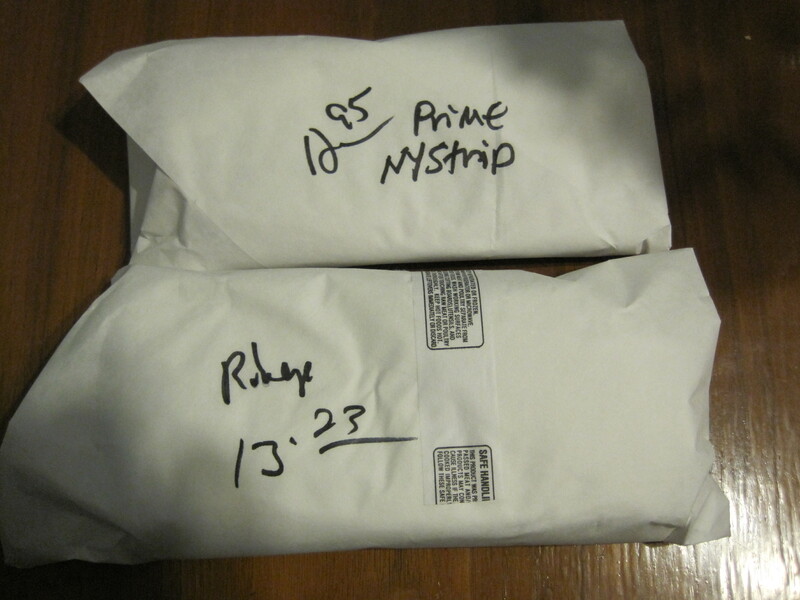 I bought a prime New York strip and a choice ribeye for the holidays. Patton’s offers a lot more than just beef, however. It sells a very nice but small collection of produce. Good looking tomatoes, potatoes, and mushrooms dot the store. There are sauces for meats. There are home made sausages, such as Italian sausages and jalapeño and cheese sausages. Patton’s is neat and clean, and smells no different than any higher end grocery store I’ve been in. When I was there, it was full of shoppers. There were so many people behind the counter, though, I never felt as if I had to wait at all. 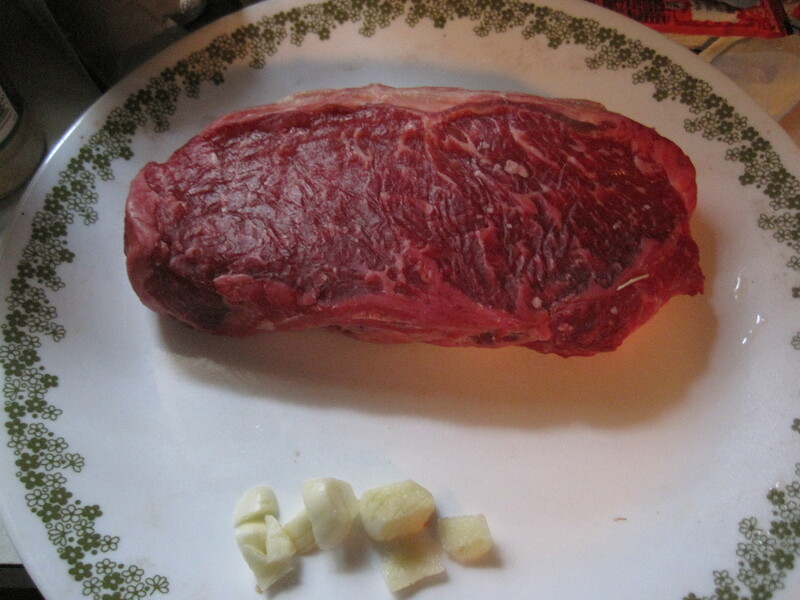 Prime strip, waiting for a garlic rubdown. I recently cooked the strip. It was an excellent cut of meat, very tender. To get there from Snellville, I’d take Pleasant Hill from I-85 until you reach the Hill Drive intersection. This is the 4 way just after Super H Mart, and just before Wall Mart. Turn left here. This road becomes North Berkeley and the traffic is much lighter along this route. Patton’s itself is behind a gas station, so if you see the gas station on the northwest corner of Peachtree Industrial and North Berkeley, then just head a little past the gas station ands enter the mall area. I recommend this as a convenient place to buy the highest grade of meats. Marina has mentioned that you can get other delicacies here if you ask, such as bison steaks or goose liver. So ask. You don’t know what they may be able to provide you with. When I saw this t-shirt ad, I couldn’t help but break out laughing. For those who never saw Redd Foxx and the show “Sanford and Son”, I guess it’s time to dig around on “Youtube”. He was always coming up with some inventive variation on common alcoholic drinks such as Ripple. 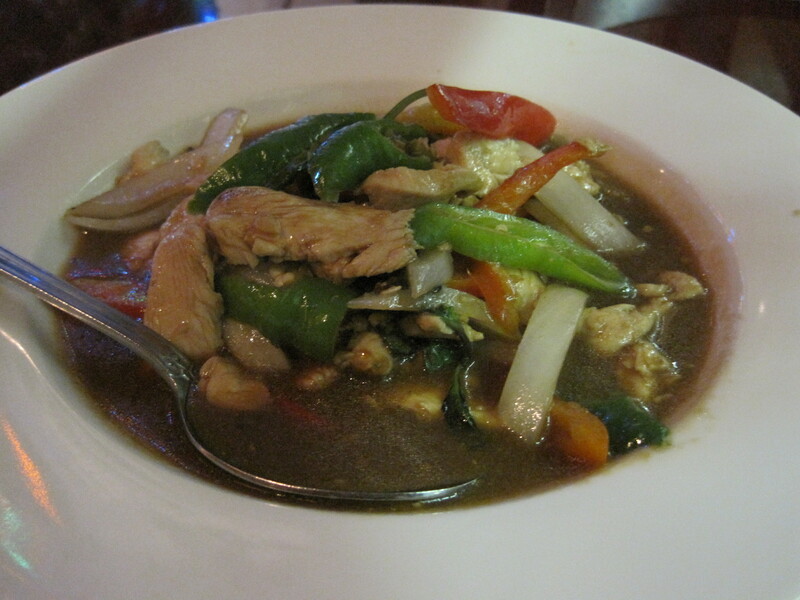 Wild Ginger is a modest Thai and sushi restaurant found on Savoy Drive, a road that parallels 285. I don’t go here often but when 285 traffic is dreadful I will exit the Interstate and travel along Savoy. In one of these moments I stopped and tried Wild Ginger. I liked the looks of the place, puzzled at the inclusion of sushi, thought the food wasn’t bad. I hadn’t been back until now, until the awful mid December 285 traffic drove me off the road again. It is pretty inside. Nice tables, wine racks, a good looking bar greet you as you enter. That, and an ever cheerful Rachel Ray on the flat screen. This is one of the few restaurants in town where a flat screen doesn’t have sports. Instead, Wild Ginger tends to tune to the Food Channel. Service is unhurried and graceful. White shrimp crackers end up on your table by magic. 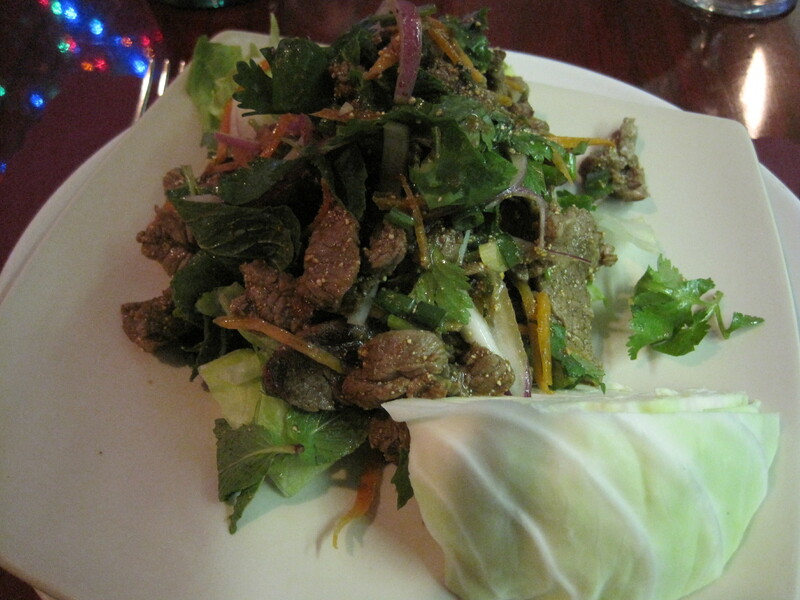 I decided I wanted to try a salad and entrée, so I ordered nam tok and the chicken entrée spicy basil leaf. Nam tok, when it arrived, looked good. But I could taste the salt on it and that affected my pleasure in the dish. Not bad, but would have been better if the salt wasn’t such an obvious part of the taste. I enjoyed the spicy basil leaf much more, in part because whole chunks of long hot peppers were used to spice the dish. Long hots are spicy but not overwhelmingly so, and spicy plus good flavor equals a lot of joy in my book. Verdict: Good food, welcome respite from a difficult commute. Recommended.